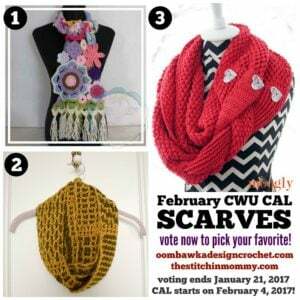 You are here: Home / Free Crochet Patterns / CAL / 2017 CWU CAL / Vote for February’s Scarf Pattern #CALOFTHEMONTH2017 Now! Vote for February’s Scarf Pattern #CALOFTHEMONTH2017 Now! Hi everyone! We hope you enjoyed (or are enjoying) the January Pillow CAL! It is time to vote for the February choose your own adventure CAL. This month we will be voting on 3 different scarf patterns! We polled the CWU CAL group to ask you which types of projects you were most interested in and from your answers we are going to create 1 year of monthly CALs you can participate in. Each month we will give you 3 projects to choose from and you get to vote for your favorite. This will decide the pattern we will make for the month. The voting will begin on 2nd Saturday of the month prior. You will have 1 week to vote for your favorite project. We will then announce the CAL project on the 3rd Saturday of the month. You will have about 1 week to gather the supplies you will need to make the project and will have the entire month of February to work on the project, create your project pages in Ravelry, and share your progress in the event created in the CWU CAL Facebook group. Visit us on January 21st to find out which project was chosen! The February 2017 CAL will begin on February 4th. Join us here! Remember you can favorite and queue all of these designs for later on Ravelry! That way if your favorite project wasn’t selected to be worked on in the group you can still work on it at a later date! It could even become a future CAL project if there is interest!